In order to be observed under a microscope, the rocks must be so thin that they become transparent, so that the light can pass through. 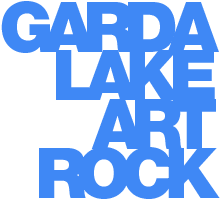 The rocks are cut, and an initial slice about 2 cm thick is then thinned using a diamond cutter. When the rock is a few mm thick, it is attached with resin to a slide to support its structure. The rock sheet is observable when we reach the thickness of 3 hundredths of a millimeter. 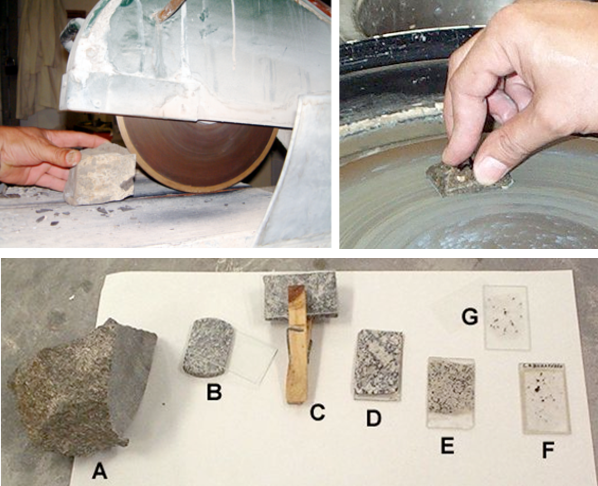 Petrography is the science that describes rocks in detail, specifying the mineral content and textures. 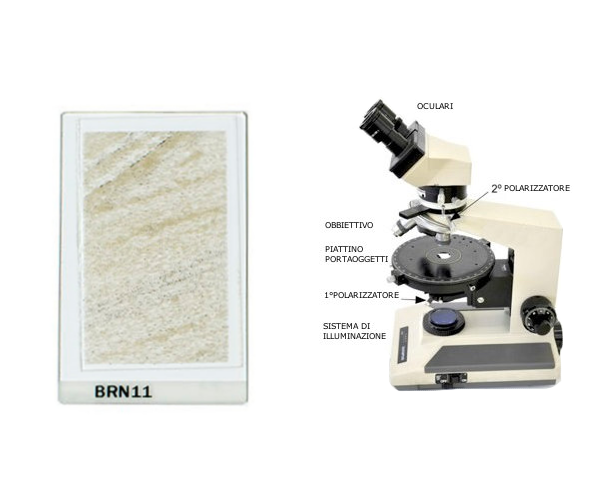 The microscope, thanks to the use of polarised light, is the most important tool in petrographical analysis because it makes it possible to study thin sections. Slices of rock as thin as a piece of paper are analysed optically, making it possible to recognise the minerals present and to understand where they come from. With the microscope it is also possible to analyse other morphological properties (microstructures) of the rocks. The petrographic microscope provides a magnified image of the thin section of rock placed on the stage. A dual lens system helps to obtain a visible magnification. The objective is made up of a series of lenses at specific intervals which produce an initial magnification, providing a very clear image. The ocular lens further magnifies the image. The total magnification is calculated by multiplying the objective magnification by the ocular magnification, for example: 50X⋅10X=500X. Furthermore, this particular microscope has two polarising filters: the first, located between the light source and the stage, converts non-polarised light into polarised light, and the second, also known as the analyser, located between the objective and the ocular lens, polarises the light again. The polarising filter is a device that only allows polarised photons that oscillate at a specific vibration to pass through, hence the term “polarised light”. In order to analyse the rocks, they have to be polished down until they become transparent so that light can pass through them. But even if they are extremely thin, some “opaque” minerals do not allow light to pass through, and therefore produce black areas in the thin sections.